This tutorial walks you through the steps to prepare and import data for a choropleth map in Datawrapper. We have a separate, equally short tutorial on how to create a symbol map. The value for each region. The values can be percentages (43.4%), full numbers (38430), or categories (yes/no/maybe). Our table will have the column "Unemployment Rate" with numerica values. Tip: You can speed up the process to import your data by firstly going into Datawrapper, look for the map you want to use and then copy the names (e.g. for countries, provinces, regions) which are used by Datawrapper into your own data table. This will make the import process later much faster. We are usually using English names for all regions at this time. Plus, we use a specific form of writing. We are aware that in some regions the same place might be written in different ways (e.g. "Saint James" or "St. James" or "St James). Datawrapper, at this stage of development, will only understand one specific way of writing. So, by copying the names from Datawrapper the process will be faster. Write your values directly into the Datawrapper table. This takes a long time, so we don't recommend it for maps with lots of areas (like our US county map). Click on "Import Data", then copy & paste your data into the table that appears. That is the most convenient option and you'll probably use it most often. Click on "Import Data", then "Click here to upload a CSV file" and upload a CSV. If you're a fan of CSVs (e.g. because you export them out of R or Python), this will be your preferred option. 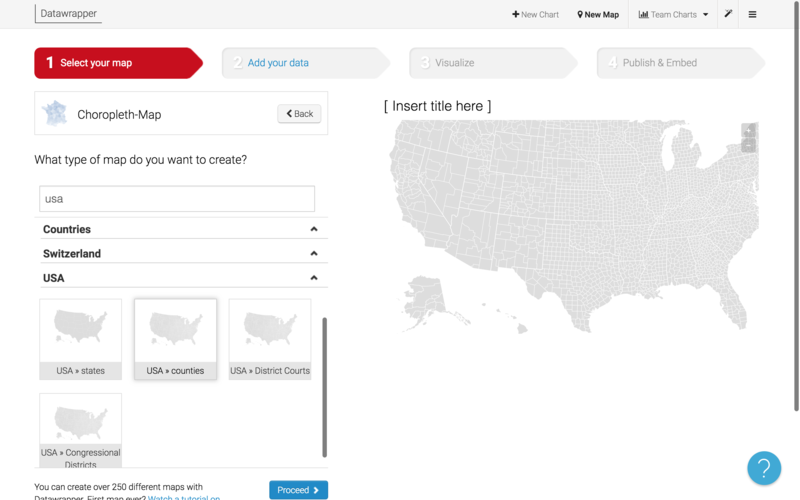 If something's wrong with your data, our map feature will tell you immediately and let's you correct it on the spot. Click "GO! ", check the data in the table again and then click "Proceed" to get to the next screen, where you can customize your map. We will cover this part in the next tutorial: Customizing your choropleth map.